Stay connected behind the wheel with Garmin DriveSmart, the navigator that features a collection of smart features in addition to helpful driver alerts and easy-to-follow directions. From hands-free calling and live traffic information to Built-in Wi-Fi and more -the future is on your Garmin. Just look ahead and drive. I was a bit concerned when I read some of the reviews about this unit. It is a new model, so it’s reasonable to be wary about bugs at the very least or serious hardware problems at worst. Now that I’ve setup the unit and used it on the road, I can say that you have nothing to fear. I’ve owned several Garmin GPS units over the years and this one is by far the best with regards to the amount of useful features, screen size, screen readability, navigation prompts, etc. To ensure that you have a smooth experience, make sure that you charge the unit, put it on your WiFi network, and update the firmware before you do anything. Second order of business is to update the maps. Thirdly, read the manual. 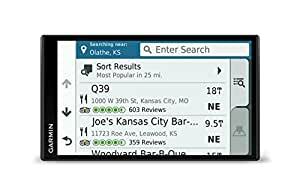 Most of us reasonably expect that a modern device is going to be user-friendly, but this GPS — at least for me — was a huge jump in terms of features. So do yourself a favor and take a look at the user manual. Lastly, look into all of the apps that allow it to connect to your phone or even compatible smart watches. New devices can work in ecosystems to bring you the best features while keeping costs down. The DriveSmart 61 LMT-S definitely fits that description. Since I am my girlfriend’s official pilot wherever we go, I just paired up my smart phone so that I can take advantage of extra features while driving. That takes me to voice controls. Smartphones generally use “natural language” for voice controls. The DriveSmart 61 LMT-S is a bit different. It relies on short voice commands and a menu-driven system to perform tasks for you. Make sure that you give it a good “wake up” command to avoid the frustration of being ignored. I gave my unit the command “Garmin wake up!” and it works very reliably. Longer wake up commands work better. In general, the unit understands my voice commands pretty well. However, it has a bit more trouble with street or business names. Garmin has some homework to do in that department, but everywhere else, this unit shines. I loved the improved prompts, generally better pronunciation, the visual assistance for turns, the hazard warnings such as pronounced curves on the road, etc. I am so happy with this unit that I ordered a Garmin Fenix 5X watch to try out expanded navigation after I’ve parked my car. Unfortunately I was born geographically challenged; I get lost in my own living room. I need all the navigation help I can get. I’ll post updates to this review as needed. Love the capacitive touch screen and size. Display is really nice compared to my older Nuvi 1450LMT which this new Garmin replaced. Everything is clear and easily readable, even from various angles. Unit is fast and responsive with no noticeable lag during various operation. Voice command works good for basic commands, ok. It’s hit and miss with street addresses however. Volume level is quite good and it does have an option for auto volume level to compensate for road noise. However, I have the auto volume level control enabled and it does not work. I hear no change in volume with windows open or closed, radio off or on. Unit stays cool. No overheating issues. Would have preferred a magnetic mount for this rather than the round plastic snap-in type it comes with. The newer round type mount is annoying. Sometimes I actually end up pulling the mount off the ball when removing the unit. Have only used Bluetooth connection with phone a few times just to test it out as I really don’t need traffic info where I live. I do not use (or need) the Foursquare or the TripAdvisor apps. I think I read on some forum that perhaps you can use a Garmin HD Charger/Traffic receiver with this and it works fine. Unit has around 16GB of main memory. About half of that is available for personal use (after deleting unused voice files) and worry free map update sizes that will fit without the need for an SD card. Wifi update works well. Updated Software and Maps fairly quick on a good network. A bug I found was the unit said (had the highlighted download arrow) I had an update available but when trying to update, it would then say “No updates Available”… I turned the wifi off the unit then back on and tried again, and it worked. Make sure you turn off the wifi and/or Bluetooth when not in use because it consumes more power on battery use. Unit will auto power off and on if your power plug/port powers on/off with vehicle. You can put your saved points/addresses into categories which makes it easier to look for certain stored items without having to look through an entire combined list. One of the things that I do not like is the plain square flat greenish map symbols that have replaced the previous multicolored shaped ones. It would have been nice to see at least a better variety and color options. Using Garmin Express to update features… there are no other American voices that speak “Real Directions” I did not see any male voices either. No other add-ons like Map Symbol Icons or ecoRoute like the Nuvi has. One thing that puzzles me is that if you put in an SD card that you have your backed up gpx files on (stored points/addresses) it copies them into the main internal memory automatically. Remove the SD card and all that info is now available internally… So to me, whats the point of having an SD card if it just dumps everything into the internal memory anyways? Should at least have an option for this. Garmin should make all its GPS’s with the glass touch screen with capacitive touch. I probably would have bought the 51 LM if it had the glass screen as this one. The only other option is the more expensive Garmin DriveLuxe 51 NA LMT-S. I don’t really see a need for the FourSquare and TripAdvisor apps and I will never use them on a GPS. This really needs to be fixed along with the accuracy. Speed signs are not as quick to update like on the Nuvi 1450…not sure of the reason why. The routing algorithm it uses is ridiculous at times. I do not think they have improved much in this area… It still picks weird routes when you know the once you usually take is the better choice regardless of its settings of Shorter or Faster calculation. Overall I am happy after using it for a few months. After taking it on several trips I have decided to keep it. The animated split screen when a junction is coming up telling you which lane to be in or which lanes you can be in is… quite awesome. I still think the price paid was a little on the high side. I have even plugged in the ol’ Nuvi 1450lmt and used it at times. If you want a really nice and easy to read 6 inch+ screen that offers easy input with capacitive touch, then this would be the unit to buy. If not, I would consider another unit that’s not quite as expensive but will still get the job done. I purchased the Evecase Portable Case Bag Cover with Extra Front Pocket 5-Inch…It actually fits this unit well even though it says it is for a 5 inch GPS… Just about the same Internal dimensions as the 61 LMT-S.